We test binocular vision functions and eye coordination which relate to visual skills used in learning. We only prescribe glasses when they are necessary and we dispense high-quality frames and lenses with kid-tough guarantees. 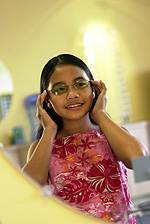 We fit contact lenses for children and teenagers and teach them how to handle them safely. Children should receive their first eye exam before the age of 2.